Then there was the comfortably solid looking man behind the Info desk in the lobby of the Portland Building, David Muir by name. (Read on to see why this is the one building in Portland I had on my list to visit.) He had received a plaque for being some sort of superior citizen in his role of greeting visitors and directing them around what is a 15-story municipal office building next to city hall and headquarters for the city's service agencies. I wanted the day's New York Times and the newsstand in the lobby was closed for some reason that afternoon. He wasted no time reaching for the phone and dialing up the nearest Starbucks, asking them to put aside a copy for me. That led to a conversation about why all the tragedies of the week were being portrayed so graphically on front pages of newspapers. Ah, Portland, the last holdout of the sanctified. But it was the sight of a crew in blue on trams marshaling riders in person to see who was a registered voter and, if not, why not - sign right here. Young friendly faces patiently approaching strangers who, like as not, looked up in annoyance. It was a contract job, conducted by FieldWorks (see the web please). Nonpartisan, bipartisan, what have you. The first of its kind I've ever witnessed in any city in the world. One free bus later my friend and I are deposited outside Portland's famous rose garden: masses of them, even bluish purple blooms, lined up in squares across rolling acres on the north side guarded by tall stately pine trees. Another welcome face, only a bronze statue this time: model of a man called a Rosarian, the official greeters for the city who traditionally turn out in white suits. Why white? Who knows. And the jolly bus driver so willing to put all us tourists straight about the what and why and where. Public restrooms in Pioneer Square, the open center for visitors to mingle or simply rest on stone steps while perusing the next sight on their itinerary. 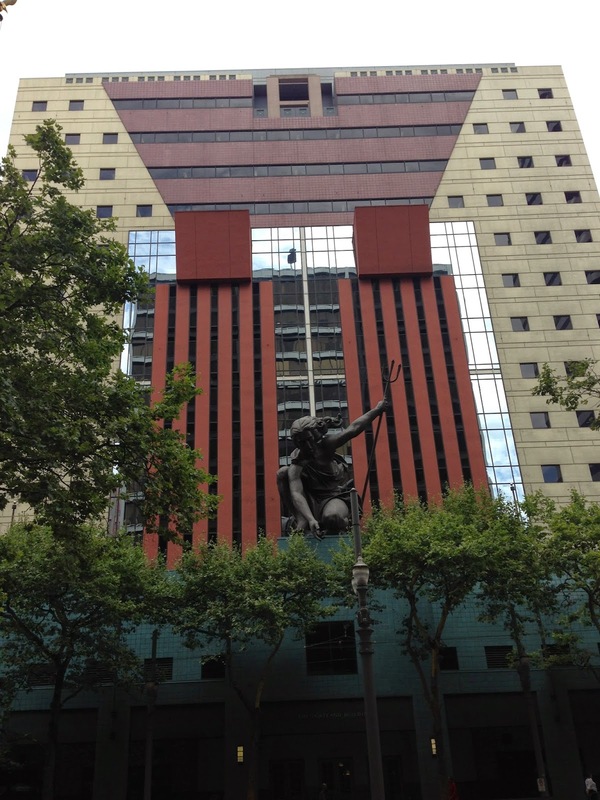 Ok, so back to Michael Graves' magnificently eclectic Portland Building with its landmark status. It cost $29 million to build, opened in 1982, has a green roof installed in 2006 (so goes Portland) but workers there are said to hate the place. It works on the outside: a colorful range and variety of surface materials and decorative touches that made its mark as one of the early and most successful Postmodernist structures of this century. Anything but gray steel and predictable straight lines.Like a phoenix rising from the ashes of contemporary blandness. Ah, but there was apparently not enough money to ensure its functioning features. A debate currently rages (as debates are said to do) whether it is a tear-down or a remodeling job. My vote, probably the majority now, is for the latter. Keep Portland green but not boringly so. Musings and cruisings on the (primarily) urban side of life by writer-artist-educator who has logged many years in New York, Washington, D.C., and beyond, plus a portfolio of line drawings done live en route of known and unknown people and scenes.